To join the Malmesbury & District U3A, please download the ﻿﻿﻿Membership Form﻿﻿, and complete it and return to the Membership Secretary (address on the form) together with a cheque for £12 per person. Please enclose a LARGE (A5) Stamped Addressed Envelope for the return of your Membership Card and M&D U3A Handbook. or 2. renew on-line - please see the "Renewal On-line" notes in the Members' Area . PLEASE NOTE: The Membership Year of the Malmesbury & District U3A runs from 1st September to 31st August. It has been decided that for any new members joining between June 1st and August 31st, their membership will last until August 31st the following year. Constitution: Here is the Constitution of the Malmesbury & District U3A. 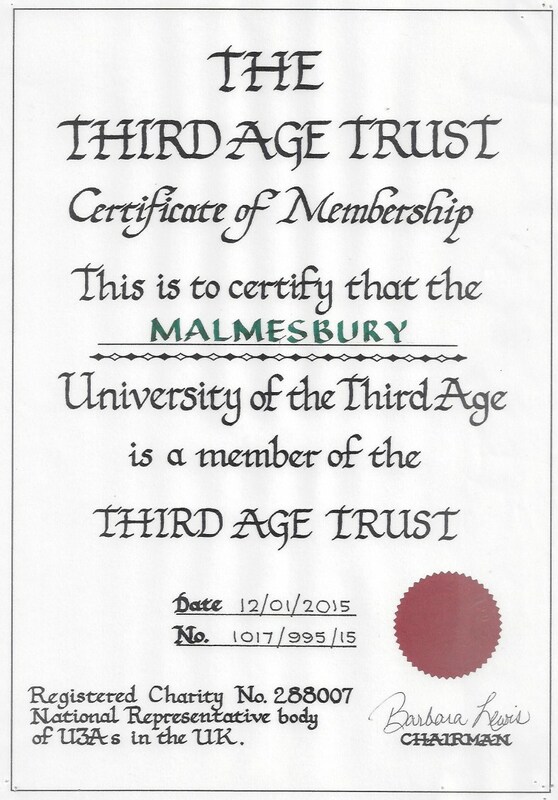 Third Age Trust: Malmesbury & District U3A is a member of the Third Age Trust, charity no. 288007. The certificate of membership can be viewed here. Note: The downloads on this page are in PDF format. To view it you will need the latest version of the free Adobe Acrobat Reader. To download a copy, click on the button.